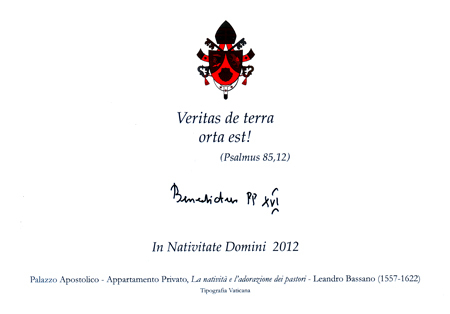 The Holy Father Benedict XVI has named Judges of the Court of Appeals of the Vatican City State the Rev. Msgr. 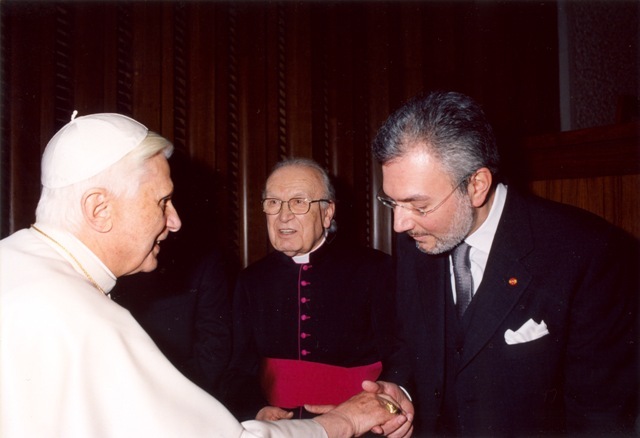 Egidio Turnaturi and the Honorable Dr. Riccardo Turrini Vita. So what? As Sandro Magister recalls today, the Honorable Judge is a member of Una Voce Italia - not only a member, but former President and part of the current Presiding Council elected in 2011. He was named based on his great personal merits, but his obviously public attachment to the Traditional Mass has not hindered him. Auguri per il nuovo incarico! In the agitation that followed the promulgation of the decree recognizing the "heroic virtues" of a recent pontiff, many great names remained somewhat in the shadow, including a long list of new martyrs now recognized, who were killed by the Spanish Republican forces in the greatest anti-Catholic persecution of the 20th century. Keeping our long-held devotion to this blessed multitude of martyrs, we will present some of those who will be beatified in the upcoming months, beginning on this feast of the Holy Innocents. Spain and Portugal brought countless millions to the Church of God - a work of great missionary orders. But back home, many religious men and women stayed "behind" helping with their cloistered prayers the expansion of the Catholic faith through the great enterprise of the Discoveries. Among these was one particular order that is quintessentially Iberian, and whose houses were always greatly favored by the Iberian royal houses: the Hieronymites (the Jerónimos). In Spain, the Jerónimos were also everywhere: their well-deserved fame of sobriety and religious seriousness led them to receive intense royal support. It was in their Royal Monastery of Our Lady of Guadalupe, in Cáceres, in 1486, that Christopher Columbus first tried to persuade Queen Isabella that his design could have great religious consequences for Castille. It was the Queen's confessor and main spiritual advisor, Fray Hernando de Talavera, Prior of the Jerónimos of Valladolid, who would convince her to support the adventurous Italian. 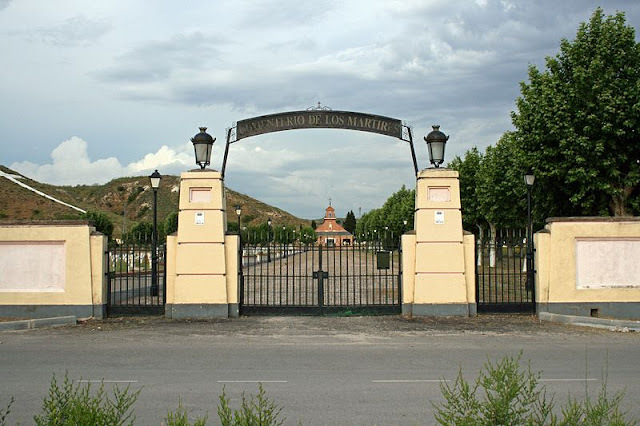 It was also to the same Royal Monastery that Queen Isabella would return to give thanks to God and the Virgin for the reconquest of Granada, in 1492, having Talavera appointed first Archbishop of Granada. It was in the Hieronymite monastery of Yuste that Emperor Charles V chose to remain in the last few years of his life. It was in the San Jerónimo Monastery of Madrid that he would have his son Philip proclaimed Prince of Asturias in front of the Cortes. It was for the Jerónimos that King Philip II would build one of the greatest religious bulidings of all time, the Royal Monastery and Palace of San Lorenzo de El Escorial. 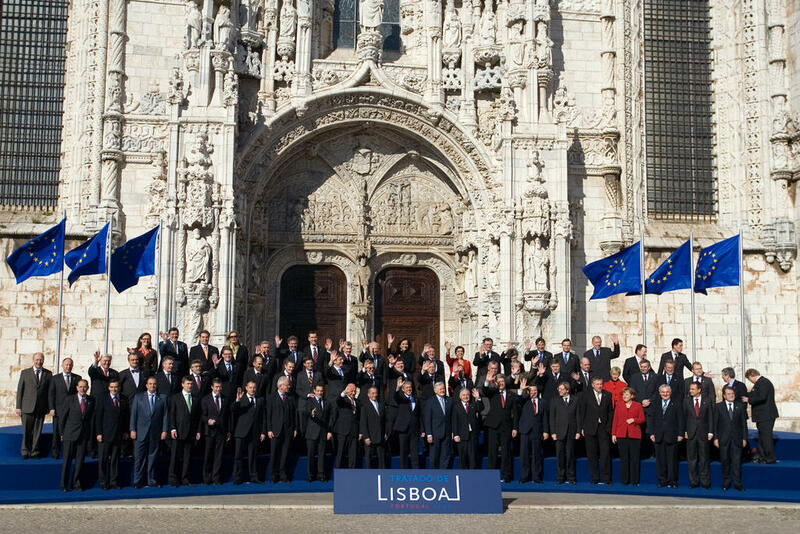 As in Portugal, in Spain a liberal monarchy would also expel the Jerónimos from their houses in the 19th century, though most Spanish religious buildings were later returned to the Church. While the feminine branch of the Order managed to survive the ordeal in Spain - but not in Portugal - the monks were disbanded, apparently forever. Until, that is, a 37-year-old layman tried and managed to do the impossible, reconstitute the most significantly Iberian monastic order: and he did in under 12 years, right in the middle of the most troubled time in Spanish history. Moved by Providence and encouraged by the remaining feminine houses, Manuel Sanz Domínguez, a high manager in a bank, left his life as a banker and went to Rome in 1923-24, persuading the Curial authorities that he had what it took to restore the Order. And he established it in 1925, in the ruined remains of the Hieronymite house of the Royal Monastery of Santa María del Parral, just outside Segovia. The Monastery that remains today is only one, El Parral, but it stands - as always, the nuns have expanded much more. Only six members were left alive following the Republican persecution. The Hironymites were also, of course, hit by the modernizing trends of the 1960s: Father Manuel Sanz would never recognize the liturgy forced upon Spain after the Council. But considering the war and the Council, the fact that they are still there is nothing short of amazing. He did his part, and was called by God to receive his glorious crown in 1936. With such a powerful intercessor, it is unlikely that the Jerónimos and Jerónimas are going to disappear anytime soon. 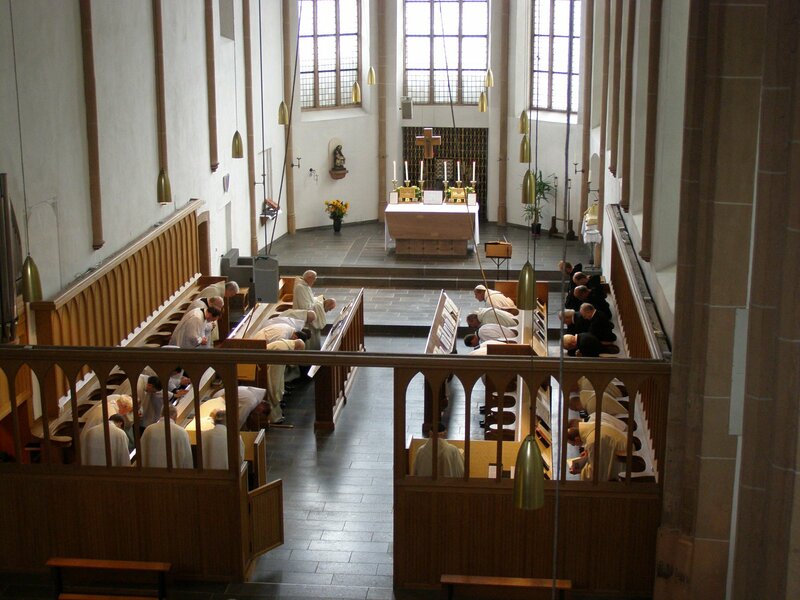 The Reform in the Trappist Abbey of Mariawald: "Putting God back at the center of the life of the monastery"
2) Can you tell us the motivations that led you to embrace the Motu Proprio Summorum Pontificum and to choose the extraordinary form at your Abbey, late in 2008? Dom Josef: In our community there had been no visible fruits of the changes brought about by the second Vatican Council and our numbers had fallen drastically. From 1965 to 2011, many monks left the monastery and we had only two confirmed vocations. And so, faced with the new liturgy's anthropocentric tendency, the desire was born to put God back at the center of the life of the monastery. Just as a tree lives only when it is fed by the energy it draws up through its roots, so too the monk (and not only the monk!) needs the wisdom of a centuries-old treasure to restore her youth to the Church. 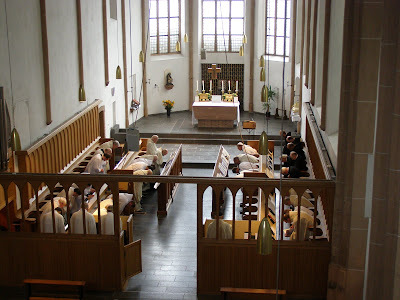 Note that the liturgy at Mariawald is not completely identical with the Roman rite. It has its own specific features in terms of the calendar, Eucharistic liturgy, and especially as far as concerns the Breviary (the Liturgy of the Hours). 3) What changes has this choice meant for your religious life? Dom Josef: The reform as (sic) made the monks' spiritual life more demanding. The new--understand “ancient”--liturgy requires an appropriate learning process: singing Gregorian chant is an art that demands a specific formation; attention to Latin as the proper language of worship demands willpower and diligence; reciting the Breviary takes longer and starting the Office at 3am demands a true willingness to surrender onself. All these sacrifices are rewarded by the discovery of heretofore unknown riches. 4) What influence has it had on the quality of your community life? Dom Josef: Forty years of the new liturgy make any new change of orientation difficult, especially for the older brethren. These days, however, the earlier tensions have eased and the situation is more serene. Openness to the Church's uninterrupted tradition and the more intense spiritual life are slowly bearing fruit, especially when it comes to new vocations. There is no room for impatience. If I may use the image of one of the Abbey's friends: reforming Mariawald is like turning around an ocean liner going at full steam: it takes time. Mariawald needs time . . . and also everyone's prayers. 5) What assessment are you in a position to make of this choice today? Has it had an effect on the vocations you have been attracting? Dom Josef: If you wish to ask me for an assessment, I would say: “I would do it again, despite many, and sometimes subtle, difficulties.” There have been and there still are many candidates to enter at Mariawald: since the 2008 reform, between forty and fifty. But most of them do not stay because of the demands specific to the strict rule that we observe. This reflects a general phenomenon in our present-day society: the inability to commit on the long term. Ones sees it in the refusal to marry, the ever more general practice of cohabitation, and the increasing number of civil divorces. This fear of commitment reaches all religious orders and is not tied to the nature of our reform. In 2008 we were twelve monks at the monastery. Two have since passed away. Today, therefore, there are ten of us, including a brother who has recently made his solemn profession (there's one who isn't afraid to commit!). We also have a novice and shall welcome a postulant this year, and there are two or three people who have shown serious interest in joining us. We also have three monks who live outside the monastery. The devotion to the Child Jesus goes back to the very origins of Christianity. There are somewhat legendary depictions of the Child Jesus in the Apocryphal Gospels (cf. Infancy Gospel of Thomas, that presents a super-hero Child Jesus). We then see the Child Jesus appear notably to Saint Jerome, and also to Saint Catherine of Alexandria. In the Middle Ages, the entire world is aware of the closeness between Saint Anthony of Padua and the Child Jesus. But it was in the 16th century that the devotion to the childhood of Christ received a great boost thanks to the Theresian reform; therefore, it was mainly the Carmelite spirituality that favored it. In all her travels, Saint Teresa of Avila took with her a statue of the Child Jesus, and she placed a new one in each new Carmel. It was thus that the Child Jesus was considered the true founder of each new monastery. You are aware perhaps of the famous apparition of the Child Jesus to Saint Teresa of Avila, whose name in religion was Teresa of Jesus. 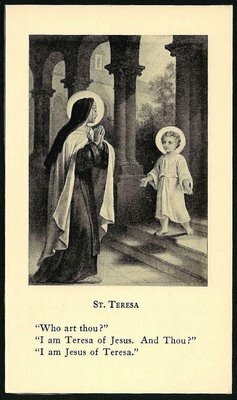 The Child Jesus appeared to Teresa on a staircase in the monastery of the Incarnation, and told her: "You, you are Teresa of Jesus, and I am Jesus of Teresa." All those sisters who accompanied Saint Teresa shared this devotion, and those who came to France to found the reformed Carmels naturally brought it with them. And precisely in France the arrival of the Spanish Carmelites was in great measure the work of Cardinal de Bérulle, one of the main founders of the French School of spirituality, that is so insistent on the Incarnation. 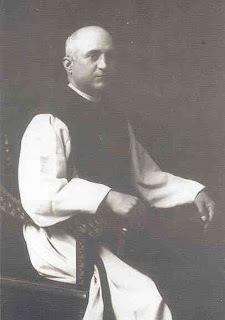 Bérulle's theological choices prepared prepare him therefore to encourage the development in France of the devotion to the Child Jesus, and the Carmelites would play a great part in this. One Carmelite in particular, the Venerable Margaret of the Most Holy Sacrament, entered the Carmel of Beaune at 11 and died, at 29, in 1648. She would have an immense influence, even in the Court of Louis XIII, because Queen Anne of Austria goes so far as to join the confraternity founded by her. The famed baron Gaston de Renty offers the Beaune Carmel a statue that will become famous under the title of King of Grace. It is a crowned Child Jesus, at once childlike and majestic. Margaret of the Most Holy Sacrament establishes a confraternity (the Family of the Holy Child Jesus), creates a "small rosary" of 15 beads, distributes thousands of images, and has the Child Jesus feasted on the 25th of every month. But why this devotion to the Child Jesus? Because the childhood of Our Lord has something to teach us, it is filled with lessons, and the first lesson is certainly the path of spiritual childhood. 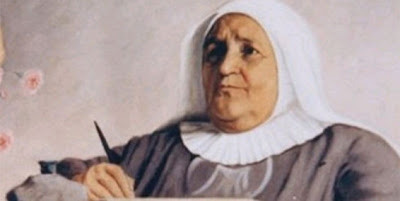 And when we speak of the path of childhood we clearly think of another Carmelite, a successor of her mother Saint Teresa of Avila, but also of the first French Carmelites. This is obviously Saint Thérèse of Lisieux, or rather Saint Thérèse of the Child Jesus. At the Lisieux Carmel, the statue of the Child Jesus that Thérèse was charged with decorating with flowers is preciously kept. And why is it necessary for us to have a deep devotion to the Child Jesus? Baron de Renty describes the spirit of childhood as "a state in which life is lived day by day, in a perfect death to oneself, in complete abandonment to the will of the Father." The Child Jesus is, first, in the manger, an infinitely feeble and dependent being. 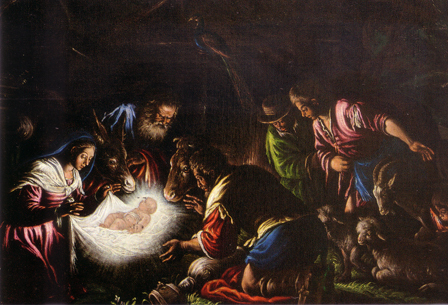 He is Almighty, but He is reduced to helplessness, to swaddling clothes he cannot even move. Then he is forced to flee from Herod. "Exinanivit," says St. Paul: He reduced Himself, taking upon Himself our condition of captivity. Swaddled, he cannot move, as up on the Cross - or the Host. (cf. 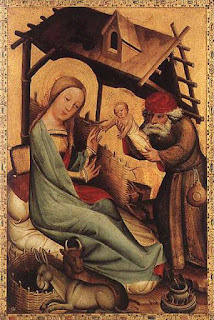 Bérullian portrayals of the Child Jesus). The state of childhood is primarily a state of confidence and abandonment. A very joyful Christmas and a blessed Christmastide to all! Grazie, Santità! Auguri anche a Lei! Summorum Pontificum Wangaratta were blessed to again host Midnight Mass at Glenrowan (Victoria), a town made famous by the Bushranger, Ned Kelly. The music was provided by a great choir based up in Albury (New South Wales) and was backed up beautifully with folks driving as far as Echuca (Vic.) and Canberra (ACT). SPWang would like to thank all those involved from singers and servers tothe flower ladies, and a special public thanks to Fr. Terence Mary Naughtin OFM Conv., whose tireless work helps provide the old Mass to those in more remote parts of Australia. 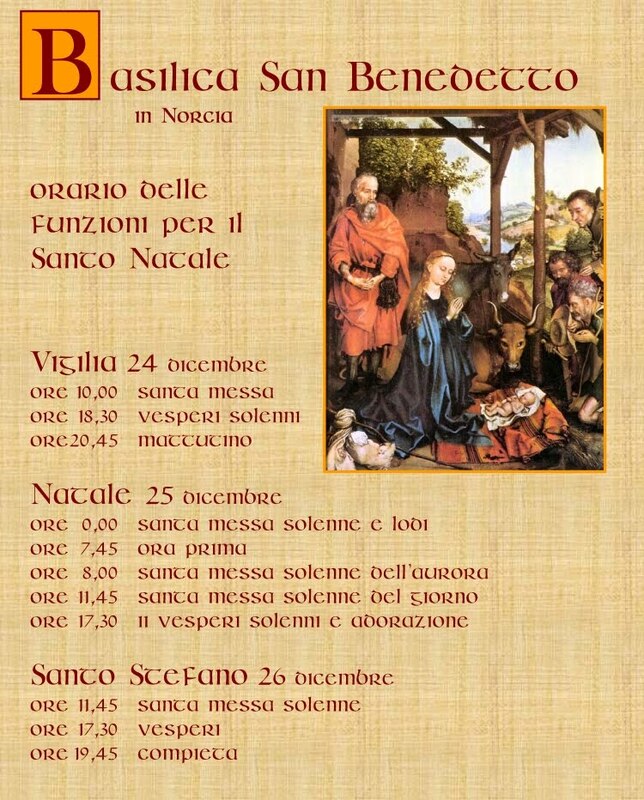 And our friends at the Monastery of Saint Benedict in Nursia (Norcia, Umbria) send us the details of masses (all masses Traditional) today, tomorrow and on St. Stephen's for those who are anywhere nearby. Buon Natale! Below, please find the sixty-fifth posting of enrolled Souls of the Rorate Caeli Purgatorial Society. It's been a long-held belief that Christmas is the time when the most souls are released from Purgatory. It is also said that the consecration of the Mass is the time that many souls are released. So for those of us going to Christmas Masses, the consecration at these Masses in particular, we know the graces pouring forth from the altar are sending many souls to Heaven. While they won't be posted online, please send the names of your deceased loved ones today. As long as they're in our inbox they're enrolled in the Society. Get them in just in time for Christmas then make your offertory intention for all the souls enrolled in the Rorate Caeli Purgatorial Society. 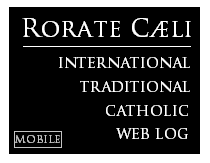 Today is Rorate Sunday, the Fourth Sunday in Advent, and a very special day for us: it is the seventh anniversary of this web log, founded on this same Sunday, 2005, and named after its introit - recurrent words throughout Advent, from its very first liturgical moment (First vespers of the First Sunday). 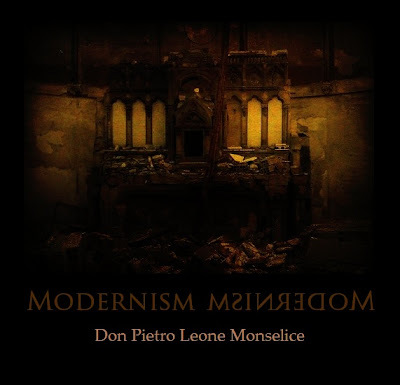 It is a perfect day, then, for us to present a special essay on Modernism and why its presence is so strong in our days - by Don Pietro Leone Monselice, the pen name chosen by a traditional Catholic priest, whose solid work on the Traditional Roman Rite and the Pauline Rite we happily published in 2011. We thank Father deeply for his new contribution to our website - and we also thank you, our readers, for the faithful readership in the past seven years. And thanks also to our followers on Twitter (@RorateCaeli). In his book “Athanasius”, Bishop Rudolf Graber, of Regensburg, explains how the Evil One in the course of the ages has attacked the Holy Catholic Church in ways increasingly refined, insidious, and intimate. He began by attacking the faithful through persecutions, but seeing that these lead rather to an increase of the Faith, he adopted another method: that of attacking the Faith itself. With the heresies of Martin Luther he managed to detach a great number of people from the Catholic Church; with the heresies that comprise Modernism, he has even succeeded at present in contaminating the Faith of a great number of people within the Church Herself. Now, what is defined by the words ‘a truth which is to be believed by Divine and Catholic Faith’ is Catholic dogma. We observe that Modernism has in fact a wider scope than Catholic dogma as here defined, in that it extends to all traditional Catholic doctrines, even if they have not yet been defined as dogmas. In other words, Modernism includes the denial not only of all dogmas, but also of all traditional Catholic doctrine. For the purposes of this essay we shall understand ‘heresy’ in a wide sense, as the obstinate denial of any traditional Catholic doctrine (or the obstinate doubt in its regard). First of all, we will present two particular characteristics of Modernism: 1. Ubiquity; 2. Obscurantism. Ubiquity concerns the extension of the heresy. In the past the Church always condemned heresies, and took this opportunity to formulate Her doctrines more profoundly and more clearly. Consequently, the rotten, heretical, branch of the Church was cut off from its healthy trunk; and the healthy trunk, nurtured by a new influx of the light of Truth, was able to flourish yet more gloriously than before. For the past fifty years, by contrast, the heresies of Modernism have no longer been condemned; or if they have been condemned, they have been but seldom, feebly, and without sanctions. As a result almost the entire tree of the Church has by now been infested by error. This infestation takes its cue from the Magisterium itself, from the teaching of the Church: of the hierarchy and the clergy. This said teaching constitutes an illegitimate use of the munus docendi entrusted to the Church by Our Lord Jesus Christ: a use illegitimate and therefore a use that also exceeds the competence of those who exercise it: a use that is extra vires. 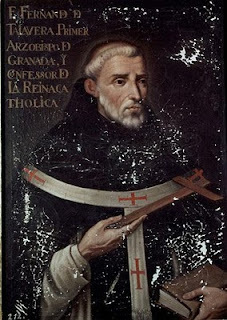 At this point we observe that we understand the term ‘Magisterium’ as the organ or instrument of the munus docendi of the Church, and we distinguish two senses of the term: a positive sense which refers to its legitimate exercise; and a neutral sense, which is the sense in which we will understand it in this essay, which refers to its exercise simpliciter, without specifying if it is legitimate or illegitimate. That the Magisterium may be exercised in an illegitimate way, will be demonstrated by the examples given below. This is obvious, and may be denied only by an ideologist. 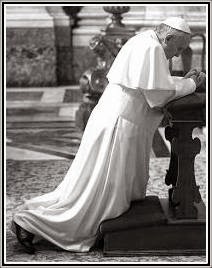 -it is difficult to criticize, above all for a priest, because he will be regarded not only as ‘hard’, but also as ‘lacking in piety’ or even ‘schismatic’ (or ‘crypto-schismatic’) towards the Church, the Pope, and the Magisterium (understood in the first sense of the term); and will have to steel himself for some mauvais quarts d’heure with his Superior or Bishop, and perhaps even the loss of his apostolate. Obscurantism concerns the communication of heresy. Heresy is the obstinate denial, or doubt, of a Catholic dogma. 1. In the past, heresy was explicit. Examples are Martin Luther’s 95 Theses posted on the cathedral door at Wittenberg. Nowadays, by contrast, in the context of Modernism, the heresy is implicit: it is implied, insinuated, suggested, favoured by obscurantism. This obscurantism operates in two principal ways: by silence or by equivocation (ambiguity). By silence a given doctrine is no longer taught; by equivocation it is expressed in a way that furthers heresy. We shall consider each way in turn. Many doctrines are passed over in silence, i.e. those that are considered “negative”, such as the existence of Hell, Mortal Sin, and sacrilegious Holy Communion. Let us look at sacrilegious Communion. This doctrine is almost never taught or preached any more. In fact, the passage from Saint Paul that condemns it, which appears in the Old Roman Rite on the Feast of Corpus Christi and on Maundy Thursday, was suppressed in the New Rite.2. Clearly this silence, as indeed silence on any article of doctrine, is not merely something neutral: the failure to accomplish an act; but something positive: a veritable act, an act of denial. Because if someone is entrusted with a doctrine to preach as a moral principle and does not preach it, the only explanation possible is that he does not deem it necessary for moral conduct, and therefore, for all intents and purposes, he denies it. If a worker notifies the headmaster of a school that there is a live electric cable in a certain classroom, and cautions him to warn students not to enter for fear of electrocution, but the headmaster omits to warn them, his silence, for all intents and purposes, amounts to a denial of the fact in question. To the Modernists’s silence on Catholic doctrines, we can apply the declaration of Pope Felix III regarding the Patriarch Acacio in the 6th century: ‘Error cui non resistitur approbatur, et veritas quae minime defensatur, opprimitur: error which is not opposed, is approved, and the truth which is defended only minimally, is oppressed’. The second method of obscuring doctrine is equivocation. Let us put this equivocation in its context. As for witnessing to the Faith, the Catholic assents to that which a doctrine declares and denies that which it denies: he says yes to yes and no to no, as the Lord Himself teaches us (Mt. 5.37): ‘But let your speech be yea, yea, no, no: and that which is over and above these is of the evil one.’ The heretic of the past, by contrast, says yes to no and no to yes; while the modern heretic, by means of equivocation, says yes and no to yes, and yes and no to no. As for epistemology, it should be said that if a strength of dogma is its clarity, a strength of Modernism is its confusion. Clarity illuminates the mind to accept the truth, while confusion confounds the mind to accept falsity. We will proceed to give three examples of equivocation. i)The Ends of Marriage 3. Until quite recently, the Holy Catholic Church has always taught that the primary end of Marriage is procreation, and the secondary end the reciprocal assistance, or love, between the spouses. Whereas at the Second Vatican Council, in the new code of Canon Law, the Catechism of the Catholic Church, and in various recent encyclicals, love is now put in the first place and procreation in the second (without, however, explicitly defining love as “the primary end” nor procreation as “the secondary end”). Let us ask ourselves the following questions: Was the doctrine of the past true and the doctrine of the present false? Or was the doctrine of the past false and the doctrine of the present true? Or was the doctrine of the past true then but is false now? Or was the doctrine of the past true in one sense and is the doctrine of the present true in another sense? And in this case, why does the doctrine of the present take precedence over that of the past? And answer comes there none. In the final version of Art.7 of the Institutio Generalis Missalis Romani (n. 27 in the 2000 typical edition of the General Instruction of the Roman Missal), the official introduction of the Novus Ordo Missae, the Holy Mass is presented in these terms: ‘Missa seu Cena dominica....memoriale Domini seu sacrificium eucharisticum: the Mass or The Lord’s Supper[…] the Commemoration of the Lord or the Eucharistic Sacrifice’. In other words the Holy Mass is identified with the Lord’s Supper in the first instance and with the Commemoration of the Lord in the second. This, however, is an equivocation. The Holy Mass is the Lord’s Supper and the Commemoration of the Lord (that is Calvary) in a certain sense (not essential), but presenting it thus simpliciter, suggests that it is so essentially: which is a Protestant position.4 In other words, to present Holy Mass in terms laden with a Protestant sense, is to present it in a Protestant sense. In summary, we have given various examples in order to show how Modernism obscures Catholic doctrine: it obscures the Catholic doctrine on sacrilegious Communion; on the order of the ends of Marriage; on the sacrificial nature of Holy Mass; and on the primacy of Peter. However, it does not only obscure these doctrines, but it obscures them in favour of heresy, since keeping silent about sacrilege is the same as denying it; the reversal in listing the ends of marriage insinuates a reversal of their valuation; presenting Holy Mass in Protestant terms, favours Protestant theology on the Eucharist; and qualifying that which is absolute relativises it. This obscurantism can be considered as a sort of partial or total eclipse of the Faith. It is partial when it consists of an equivocation which does not amount to a formal contradiction; it is total when it passes over Catholic doctrine in silence, or when it expresses the doctrine in contradictory terms: since the denial of the principle of non-contradiction regarding a given doctrine is the denial of the very possibility of its truth. The result of such denial is a Faith without truth: a Faith determined merely by sentiments and subjective attitudes, which is no longer Faith at all. If the heresy of the past is like ‘a dagger thrust’ in the words of the Abbé Dulac, the modernist heresy is like a slow poison, in such a way that one can go to bed at night with the Faith and wake up in the morning without it. Modernism acts like a slow poison inasmuch as, by obscuring a dogma, it weakens the virtue of the Faith: that is to say it weakens the adherence of the will to revealed Truth. In this way Modernism disseminates doubt about all the dogmas of the Faith. As a result, dogmas are labelled as ‘problems’: ‘the problem of the Resurrection’, ‘the problem of Original Sin’, ‘the problem of Hell’, etc. However, the dogmas of the Faith are not problems: rather they are supernatural Truths 5. They are problems only for those who deny the Faith. The Faith becomes a problem, then, and is relegated to a place alongside other Religions, or is treated as one theme amongst a variety of others. In this way the Faith is substituted for “fables”: ‘they will refuse to listen to truth and will turn to fables’: a veritate quidem auditum avertent, ad fabulas autem convertentur’ (2. Tim.4.4). The emptiness of this teaching, once stripped of its sophistication, is manifested all too clearly in the children’s catechesis. What visions of truth and of holiness are given them in the pure days of their childhood to root them in the Faith and in the life of the sacraments and the virtues, and to summon them in the final hours of their life to the embrace of Divine Mercy?6. Obscuring a doctrine, in particular by denying the principle of non-contradiction, has a further, and even more notable, effect, inasmuch as it not only obscures the Faith in its entirety, but also the very notion of Truth. For Catholic doctrines are Truths, objective Truths, indeed they are absolute Truths, more certain than the truths of the senses; and to claim that at the same time and in the same way they can be both true and false, is to deny the very possibility of Truth. The further one departs from the conception of objective truth and reality, the closer one draws to that of subjective truth and reality. In so doing, however, one is on the road that leads to madness, because madness is nothing other than embracing subjective reality. The order of the True yields to the order of the Good. Truth is no longer considered a guide to behaviour, but “love”: love, however that is no longer defined by reality. This love, inasmuch as it is rational, is manifested in humanism, a humanism lightly coloured by Christianity with a tendency towards activism; inasmuch as it is emotional, it is manifested in sentimentalism and the excessive concern for the sensibilities of others. The objective yields to the subjective, and the river of Modernism flows back into that vast ocean of subjectivism from whence it came. 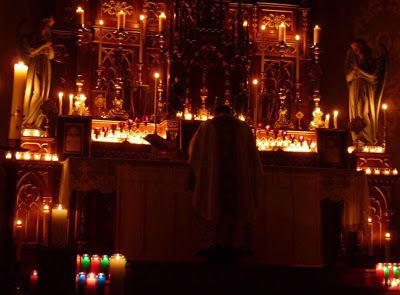 We invite our readers to post in the combox about the schedules in their communities for Christmastide Masses, Matins and Vespers according to the Classical Roman Rite. Schedules of traditional devotions are also welcome. Rorate has received this lengthy and valuable report from the Toronto Traditional Mass Society. 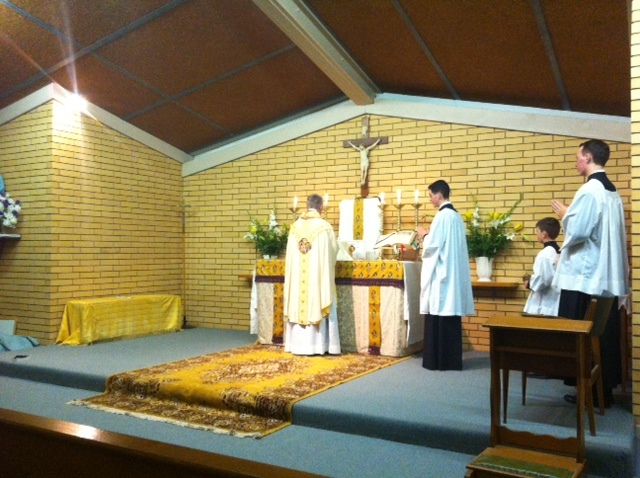 The pictures accompanying this article come from the Rorate Mass celebrated on December 15, 2012 in Kinkora (Population 30 and 160 km northwest of Toronto) in the Diocese of London in Ontario. More pictures can be found on their Facebook page. For decades the Extraordinary Form of the Roman Rite was never to be found in Toronto. For liturgical sanity in the Ordinary Form, one could have always attend St. Michael’s Cathedral which preserved dignity in the liturgy with the aid of the renowned St. Michael’s Choir School which is affiliated with the Pontifical Institute of Sacred Music. At times, there was the odd travelling priest and eventually the SSPX arrived once a week to celebrate Mass in a borrowed Ukrainian Catholic parish until that was aggressively stopped and then displaced to a university lecture hall. The SSPX eventually purchased an old Baptist building and converted it and began their apostolate which now includes a school about an hour from Toronto. A great blessing to Toronto was the erection almost 35 years ago, of the Toronto Oratory of St. Philip Neri . The Oratorians initiated the proper celebration of the Ordinary Form and set a standard unknown in 1978, even celebrating it in Latin. Eventually, they began celebrating the Extraordinary Form under the indult regime and they were only the second in the entire Archdiocese of Toronto to do this, the first being a kind and humble priest, Fr. Liam Gavigan, who was once alone in this work and to whom we owe so much. He is now 80 but still going strong and celebrates two EF Masses every Sunday. The Oratorians now celebrate daily in their primary parish at Holy Family and on Sundays at their second parish, St. Vincent de Paul and within their various chapels at the Oratory and St. Philip’s Seminary. This morning the Holy Father Benedict XVI visited Paolo Gabriele in prison in order to confirm his forgiveness and to inform him personally of his acceptance of Mr Gabriele's request for pardon, thereby remitting the sentence passed against the latter. This constitutes a paternal gesture towards a person with whom the Pope shared a relationship of daily familiarity for many years. Mr Gabriele was subsequently released from prison and has returned home. Since he cannot resume his previous occupation or continue to live in Vatican City, the Holy See, trusting in his sincere repentance, wishes to offer him the possibility of returning to a serene family life. The Votive Mass of Our Lady in Advent (Rorate Mass) has been offered at St. Stephen's since the beginning of our parish in 2002. The church fills up before 5:30 am with families who drive as much as 1 1/2 hours in the dark to assist at this beautiful Mass in honor of Our Lady. Only candle light is used in the sanctuary and in the choir loft. It is the most beautiful time of total immersion into the mystery of the Incarnation. The music used for the video is taken from our newly released CD "The Little Road to Bethlehem," which is available at St. Stephen's Bookstore (916-455-5114 or Stephenproto@yahoo.com). The words of Isaiah used as the introit antiphon of the Votive Mass of Our Lady in Advent, are also, of course, used in the introit of the Fourth Sunday in Advent, tomorrow, after which this blog, founded on the same Sunday in 2005, was named. Once again we find ourselves at the end of a year that has seen all kinds of difficult situations, important questions and challenges, but also signs of hope, both in the Church and in the world. I shall mention just a few key elements regarding the life of the Church and my Petrine ministry. First of all, there were the journeys to Mexico and Cuba – unforgettable encounters with the power of faith, so deeply rooted in human hearts, and with the joie de vivre that issues from faith. I recall how, on my arrival in Mexico, there were endless crowds of people lining the long route, cheering and waving flags and handkerchiefs. 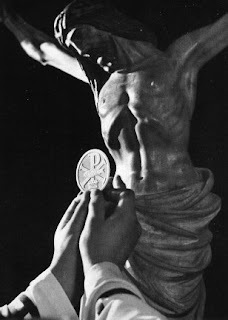 I recall how, on the journey to the attractive provincial capital Guanajuato, there were young people respectfully kneeling by the side of the road to receive the blessing of Peter’s Successor; I recall how the great liturgy beside the statue of Christ the King made Christ’s kingship present among us – his peace, his justice, his truth. All this took place against the backdrop of the country’s problems, afflicted as it is by many different forms of violence and the hardships of economic dependence. While these problems cannot be solved simply by religious fervour, neither can they be solved without the inner purification of hearts that issues from the power of faith, from the encounter with Jesus Christ. And then there was Cuba – here too there were great liturgical celebrations, in which the singing, the praying and the silence made tangibly present the One that the country’s authorities had tried for so long to exclude. That country’s search for a proper balancing of the relationship between obligations and freedom cannot succeed without reference to the basic criteria that mankind has discovered through encounter with the God of Jesus Christ. The great joy with which families from all over the world congregated in Milan indicates that, despite all impressions to the contrary, the family is still strong and vibrant today. But there is no denying the crisis that threatens it to its foundations – especially in the western world. It was noticeable that the Synod repeatedly emphasized the significance of the family as the authentic setting in which to hand on the blueprint of human existence. This is something we learn by living it with others and suffering it with others. So it became clear that the question of the family is not just about a particular social construct, but about man himself – about what he is and what it takes to be authentically human. The challenges involved are manifold. First of all there is the question of the human capacity to make a commitment or to avoid commitment. Can one bind oneself for a lifetime? Does this correspond to man’s nature? Does it not contradict his freedom and the scope of his self-realization? Does man become himself by living for himself alone and only entering into relationships with others when he can break them off again at any time? Is lifelong commitment antithetical to freedom? Is commitment also worth suffering for? Man’s refusal to make any commitment – which is becoming increasingly widespread as a result of a false understanding of freedom and self-realization as well as the desire to escape suffering – means that man remains closed in on himself and keeps his “I” ultimately for himself, without really rising above it. Yet only in self-giving does man find himself, and only by opening himself to the other, to others, to children, to the family, only by letting himself be changed through suffering, does he discover the breadth of his humanity. When such commitment is repudiated, the key figures of human existence likewise vanish: father, mother, child – essential elements of the experience of being human are lost. Congratulations to the great nation of Colombia! For their first native-born saint, Laura de Jesus Montoya (Laura of St. Catherine of Siena): the blessed nun had a miracle recognized by the Congregation for the Causes of Saints, whose decree was confirmed today by the Pope. Colombia was the largest Catholic nation still with no canonized native-born subject. Also: the Congregation decree recognizing the "heroic virtues" of Pope Paul VI was approved by the Pope, thereby acknowledging him as a "Venerable". Archbishop Müller, who was appointed prefect in July this year, oversees reconciliation talks with the Society of St Pius X (SSPX) in his new role. He told the Herald that “the SSPX must accept the fullness of the Catholic faith and its practice” as “disunity always damages the proclamation of the Gospel by darkening the testimony of Jesus Christ”. The Government announced today that a combination of legislation and regulations will be introduced to comply with the European Court of Human Rights ruling in the A, B and C case. Minister for Health James Reilly presented a memorandum to this morning’s Cabinet meeting. 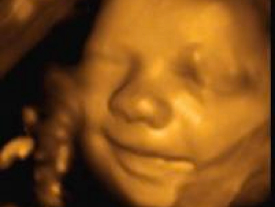 The decision was taken to follow this route – the fourth option from the expert group on abortion - rather than proposing guidelines, an option favoured by anti-abortion campaign groups. A statement released by the Department of Health said: "Having considered the report of the of the Expert Group on the judgment in A, B and C v Ireland the Government has decided that the implementation of this judgement by way of legislation with regulations offers the most appropriate method for dealing with the issue." In a statement, the Government said the drafting of legislation, supported by regulations, will be within the parameters of Article 40.3.3 of the Constitution as interpreted by the Supreme Court in the X case. "It was also agreed to make appropriate amendments to the criminal law in this area," it said. A sermon more timeless than many a passage in and about Vatican II. In 1965, Paul VI was apparently aware that even Italy was beginning to lose the true knowledge of Christ. Without necessarily meaning to, this homily sums up the whole history of the Church: the rejection of Christ by his people, his acceptance by many Gentiles, and final rejection by the world, including nations which had once accepted him. For the feast of Our Lady of Guadalupe, 12th December, we [the seminarians of the Seminary of the Priestly Fraternity of Saint Peter in Nebraska, including the Redemptorists] made a consecration to Our Lady of Guadalupe, during which we sung this litany. It was composed by a priest of the FSSP Seminary of Wigratzbad, Germany. Was there a new Pentecost after the Council? "-Yes, unreservedly yes! Just look at the Charismatics!" In this meditation I would like to reflect on the second great cause for celebration this year: the fiftieth anniversary of the beginning of the Second Vatican Council. In recent decades, the attempts to assess the results of Vatican II have multiplied[i]. This is not the occasion to pursue this line of thought, nor would time permit it. From the time of the Council, alongside these analytic interpretations there have also been attempts made to provide a synthetic evaluation - a search, in other words, for a key to interpreting the conciliar event. I would like to include myself in this endeavor and try to offer a reading of the various keys to its interpretation.